I have been LOVING eating all of my apples since our trip to the orchard a few weeks ago. But literally, as I was picking the apples, I was planning for this Apple Pie Crumble. 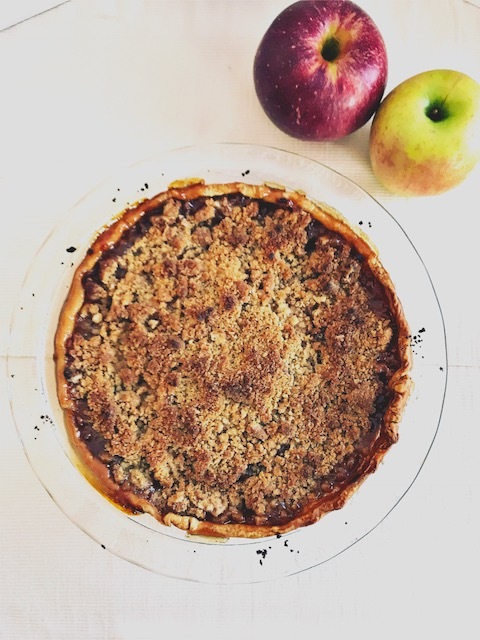 I love the flavor of baked apple swirled with cinnamon and nutmeg and sugar… and butter… and sugar… okay lets be real – I love the crust from apple pie. And I love the buttery sugarI love the sweet apple goo. And I love the buttery sugar crumble from apple crumble. As for the apples themselves – well I really like the sugary goo in both apple pie and crumble!! 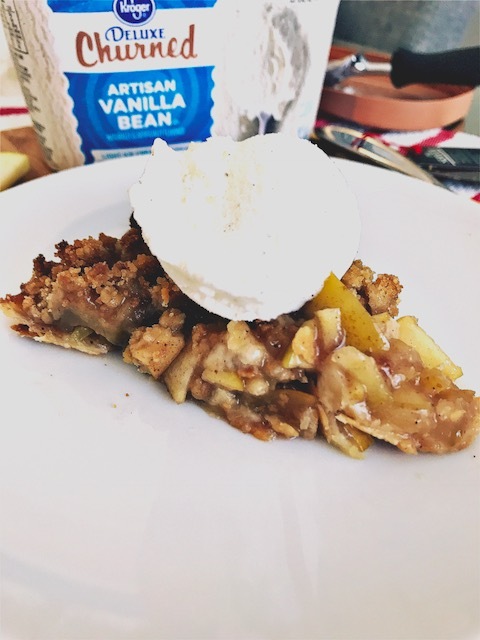 I think this Apple Pie Crumble is amazing because it combines my THREE favorite things about apple desserts – crust, crumble, and of course – sweet, sugary apple “goo.” I am making this Apple Pie Crumble sounds SO appetizing – but seriously people, you know what goo I am talking about! 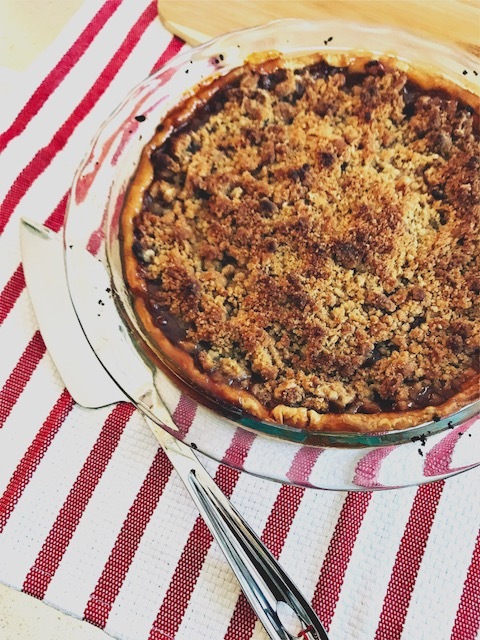 The second thing I love about this Apple Pie Crumble is that it is SO EASY! Apple pies can turn out BEAUTIFULLY! 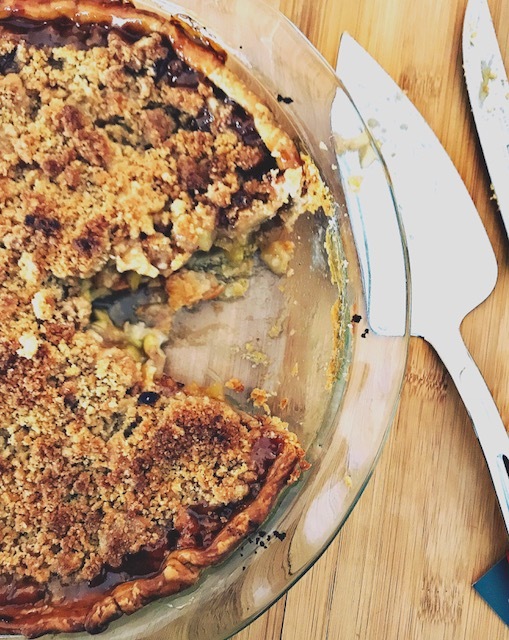 However, pie crust can be challenging – and sometimes, I just want the yum factor without the work! Even people with the least bit of artistic ability can make this recipe, no problem. If I am being honest though, its not just baked apples that I do not love – it’s all baked fruit! Something about the texture feels weird. I want my baked fruit to be barely recognizable as the fruit it once was – a.k.a. GOO! If its somewhere in between raw and baked – I am not a fan. That’s why I choose to slice and chop my apples into very small pieces! If you are a huge baked fruit fan, feel free to cut your apples into larger chunks or slices! There is ONE MUST DO in this recipe. After you have mixed the apples, lemon juice, sugars, flour and seasonings – you must let the apples rest! They will release yummy apple juice which will help make your apple pie – you guessed it – even GOOIER! Cutting the apples up can take a while, so I recommend waiting to preheat the oven once the apples are completely chopped! That way, they can rest while the oven is preheating and you prepare the crust in the pie pan. Why do I recommend using pre-made pie crust? Honestly, because it is SO easy AND it is tastes great! Sure homemade pie crust is incredible – but it is added effort and not all homemade pie crusts are created equal. With pre-made pie crust, I know the crust will be delicious and I can focus on the rest of my recipe. Feel free to use a homemade and pre-made pie crust for this recipe! So, what kind of apples should you use? 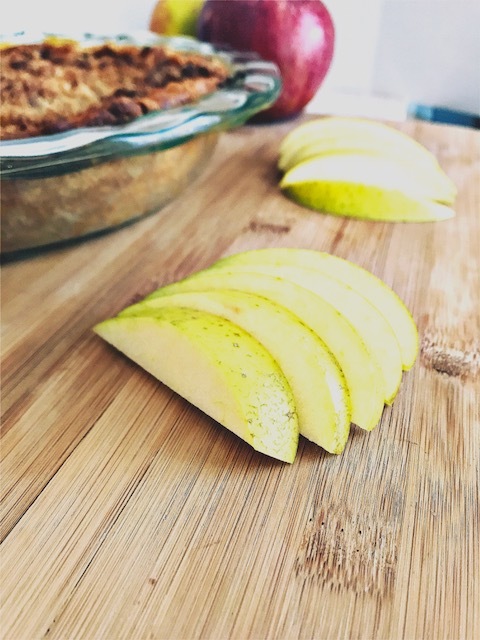 Many people have opinions about “which apples are best to bake with,” however in my personal opinion, if you like an apple raw – you will probably like it baked! If you don’t like it raw, baking it probably won’t make you like it much more! I used mostly goldrush in this recipe because that is what we picked at the orchard! They are sweet yet tart and very crisp – perfect for eating and baking. 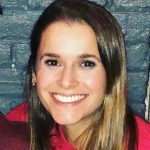 Having said that, I also highly recommend honeycrisp, braeburn, pink ladies, jonagold and gala apples – because they are delicious when fresh or when baked. Try it out this recipe out for yourself and let me know how it goes! 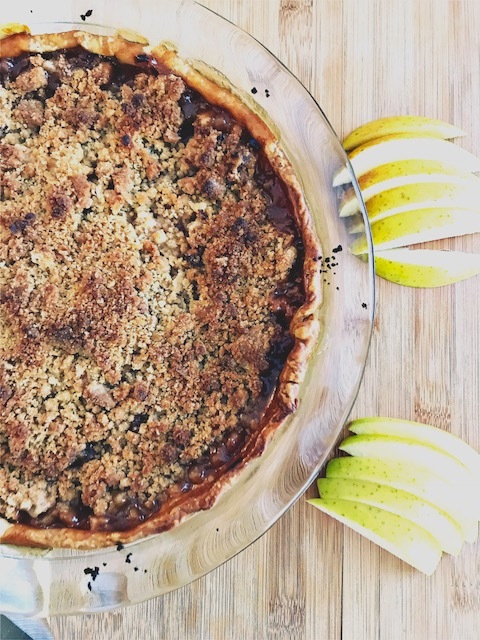 I promise, between the rich, flaky crust – sweet, cinnamon apples – and buttery flour crumble – you are guaranteed to want to a second piece of this pie. Just don’t forget the vanilla ice cream! 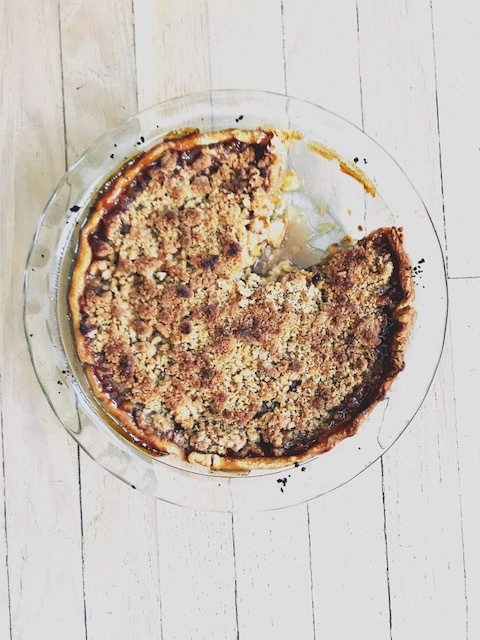 Rich, flaky crust piled high with sweet, cinnamon apples then covered in a buttery flour crumble - you are guaranteed to want to a second piece of this pie. Just don't forget the vanilla ice cream! If using a pre-made pie crust dough (like Pillsbury), remove from fridge and allow to become room temperature. If preparing from scratch, prepare dough as first step. Wash and dry all apples to prepare, then slice or chop into desired size (if you like big chunks of apple - slice thick! If you prefer minimal apple, slice thin then chop). Preheat oven to 375F. Lightly grease a pie pan, set aside. Unwrap pre-made pie crust dough, or roll out homemade dough. Mold dough to pan, folding over edges if desired. Use a fork to puncture multiple places throughout pie crust (this will prevent crust from bubbling up). Combine melted butter, brown sugar, and flour - stir until all ingredients are moistened. The sugar/flour mixture will remain as a "crumbly" texture. Pour filling into pie crust, then sprinkle crumb topping on top of filling. Cover pie with aluminum foil, then bake at 375F for 40 minutes. Uncover and cook for an additional 10-15 minutes or until crumb topping begins to brown. Remove from oven and allow to cool - serve warm or cold with milk or ice cream! Storage: Cover in plastic wrap then refrigerate for 2-3 days. Enjoyed this recipe? Check out these other amazing fall baking recipes! Classic Pumpkin Bread, Salted Dark Chocolate Caramel Bars, and Pumpkin Spice Waffles. Looking for something savory? You’ll love these fall soups! Crockpot Butternut Squash Soup (VG), Crockpot Turkey, White Bean, Bacon Chili, and One Pot Chicken Tortilla Soup.